During your gap year travels there may be a variety of times that you need a little extra cash. Medical emergencies broken equipment, stolen possessions, and changes to travel plans for any of these reasons could all total up to a bill much greater than the money left in your account. Or, even if you have money, there may be times that you just can’t get to it. For these reasons it is important to keep a credit card with you on your gap year travels, and to limit its use to emergencies only. Many people misunderstand credit cards and somehow believe that they are just extensions of their bank accounts or that they are really representative of “their” money. This is not true, in fact, using a credit card is just taking out a loan. The credit card allows you to charge purchases, which basically means that the credit card company pays the stores and merchants for you and you then owe the company money to pay back these loans. While it is true that you can decide how much to pay back to a credit card each month – from the minimal amount to the entire balance – you will be charged interest on whatever you leave outstanding. This means that the longer you leave a balance on your card, the more you end up paying back to the company, making even a great bargain much more expensive than you originally expected. With the variety of credit cards available today it’s easy to see that there are many different factors to consider when selecting a credit card. Before you can decide which you’d like, however, the card companies themselves will decide if they like you. Whether it be your bank or a private company, whatever entity is considering giving you a credit card will likely require you to prove your income or assets before they will be willing to lend you money. You will likely need to fill out an application for a credit card, but don’t worry, you have some control too. Before deciding on a credit card, be sure to investigate the fees, what will the card company charge you for annual fees, interest rates on balances, late charges and more? Check what the credit limit is, how much money would the card company be willing to give you, just in case you need it? 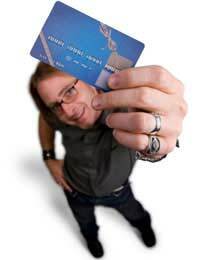 See if using the card net you any benefits such as frequent flier miles, points or cash back rewards? Finally check to see if the card accepted the world over or only in more limited areas? Credit card fraud – or when someone steals your credit card and uses it as if they were you – is a fear that all credit card users share. After all, why should you be stuck with the bill for someone else’s shopping spree? When you have selected and possess a credit card, be sure to protect it from theft or fraud. Never write down your credit card number or security information and never give out your credit card number over the phone.Never answer emails asking you to enter your credit card number or security information, even if they seem official, always go to your card’s website on your own. When you receive your credit card always sign your card the minute you get it in the post, don't put it in your purse and do it later, if it gets lost or stolen an unsigned credit card is a great find for a thief. Rip up or shred any credit card applications that come your way - so that they cannot be stolen and filled in, in your name. It is a good idea to carry the customer service telephone number for your credit card with you in case you need to get in touch. If you ever feel a little suspicious about one of your changes ring the credit card company straight away and dispute it. Bringing a credit card with you on your gap year for use in emergencies is a great idea. Just remember that with high interest rates, credit card emergencies should be limited to those that are truly serious and not just for new souvenirs!